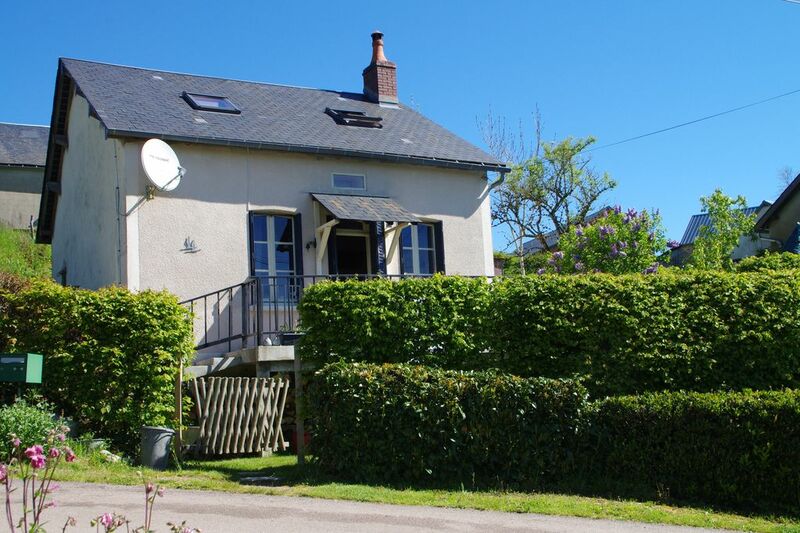 4 persons small Burgundy village property. Since 2009 we rent our house in Burgundy. The house aptly named L'Oiseau stands in a small Burgundian hamlet Montpensy. Larger well-known towns in the region Avallon, Veselay and Autun. In our completely renovated house you live in complete freedom. The lined garden offers absolute privacy. Our house exudes a romantic atmosphere. Through a wide stone staircase leads to the balcony and from there go inside the house. In the living room you stay in a room with ancient beams, you can enjoy the warmth of the wood stove. You will also find all the modern comforts: TV with wide range of Dutch, German and French TV channels. You are sitting on comfortable furniture. The use of WiFi is free. The open kitchen is equipped with cooking utensils. Oven, 4 pitsgastoestel, microwave, grill, refrigerator are at your disposal. And of course: the dishwasher! Downstairs you will find the recently totally remodeled bathroom. Upstairs are the bedrooms. The bright colors will stimulate the holiday feeling. The first bedroom has a double bed. Here is also a cot that can be optionally used. The other bedroom has two single beds. On the landing is our small library established. much information about the region, about France and "ordinary" books can be found here. Also for children's reading material available. Under the house you can see the cave. An ancient cellar where the temperature is always pretty much the same level. In summer it is a perfect place to cool your drinks. In this room you will also find the washing machine, dryer and freezer. so you can preserve your food in an easy way for longer stays. Outside, you can enjoy the spacious balcony where you can sit easy to enjoy your drink. The balcony faces south, which can already be enjoyed in the early years of the outdoors. The garden is completely surrounded by beech hedges. therefore, you have absolute privacy. There are several terssen, so it is always possible to find a place in the sun or in the shade. Picnic table and garden furniture are waiting for you. You can also use an outdoor fireplace and of course the barbecue. It is quite possible in the garden to place a children's pool. Across the street from our house you will find our small orchard and herb garden. In our house you can completely unwind. In the evening after eleven o'clock the street lights go out and appears in sunny weather a dazzling sky. In the immediate vicinity you can undertake extensive hikes. Here you will rarely meet someone. The area is sparsely populated and therefore the nature lover will be satisfied. The walking maps are waiting for you in the library! swim in one of the Great Lakes is an extraordinary attraction. Here you often a beach to yourself, where you even with a little ingenuity you barbecuetje private lakeside constructs. The large Lac de Pannciere is 4 km. away from our house. Other sporting possibilities are: sport fishing, boating. There is even a sailing school for children at the Lac des Settons. Furthermore, the excavations of Roman remains famous: the Bribracte is a museum in that area in the vicinity of the Roman town of Autun. At the weekend the antique lovers can indulge. from early spring you will have a flea in one of the towns or villages. Bargaining should, of course! Roam the extensive nature to create your own bar cepe location at one of the lakes: in this quiet environment you come to yourself completely.